I'm sitting on a curb here in L.A. and eating a cheeseburger topped with pastrami as tough-looking vatos cycle through the unmarked marijuana dispensary next door. Next to me is a two-door 1986 Acura Integra. When Jean Jennings (then Lindamood) got behind the wheel of a freshly minted version of this car for the first issue of Automobile back in 1986, she made it sound like a dream ride for cross-country motoring as she drove along picturesque California Highway 1. But today this Integra seems better suited to L.A.’s gritty cityscape, parked as it is between a sun-faded Tiburon and a clapped-out Tercel. Some 30 years ago, our readers were dumbfounded by the idea of a Honda Civic wearing Euro-style clothes, a premium badge, and a price tag of about 10 grand. 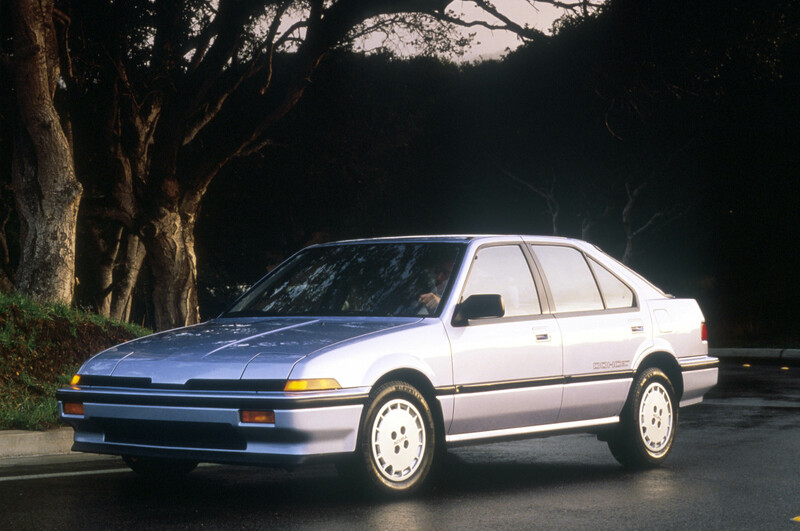 Though more handsome than the Civic, what with its flip-up headlights and a thin-pillar roof arcing rearward over a hatchback body, the Integra coupe was pretty plain in the usual Honda way. It also comes from a time when leather upholstery was for upscale cars only, so the interior of even this top-trim, $10,593 LS model wears rat-fur fabric. (At least it’s not 1970s-style vinyl.) And yet there are more than a few features that were über chic in the late 1980s, including a sunroof, power windows, cruise control, and an audio system with a cassette deck and a fully tunable equalizer. Thoughtful design, though austere; luxurious leather was a distant dream. To truly appreciate what made the front-wheel-drive Integra such a phenomenon on the streets of L.A. three decades ago, you need to pop the hood. You’ll find a dual-overhead-cam, 16-valve inline-four engine instead of the SOHC 12-valve engine that was standard fare for the Honda Civic in the U.S. This fuel-injected, aluminum-block, 1.6-liter Integra engine weighed only 207 pounds and gave drivers 113 hp if they pushed it to its power peak at 6,250 rpm. Its 99 lb-ft of torque didn’t top out until 5,500 rpm. Such high-strung performance was very much the character of all things Honda back then, and it was even more noticeable in those days before variable valve timing. Street racers would coax more power from this package with intake and exhaust modifications, though at the price of an even narrower powerband. This particular Integra LS left its Acura dealership the day after the all-new 1986 Integra model went on sale on March 27, 1986. After reaching 168,000 miles, this car went to live in American Honda’s museum near the corporate headquarters in Torrance, California. It’s a little unhappy about being on the street today for my drive, as it started to overheat and lose power at a startlingly fast rate before I pulled over and bought a burger so the engine could have a few minutes to cool off. The potheads nod at me as they leave the dispensary, but no one seems to notice the squeaky clean Integra, which is both a measure of its very plain styling and the 217,445 examples of coupe and sedan that reached American streets during this first-gen model’s life. This DOHC 16-valve engine gave Honda its street-fighting cred in the ’80s. I leave my informal luncheon stop in San Pedro and head toward nearby Long Beach, snaking along the small roads that connect boat docks and container ports. Every bit of the engine’s torque is required to get this 2,357-pound package moving at a good clip. The engine builds speed smoothly and predictably, though it gets louder and more aggressive as the tachometer needle reaches for the 7,000-rpm redline. The standard five-speed manual transmission has a silky smooth shift action, and 60 mph comes up in about 10 seconds, which was quick then yet still slower than the lightweight, 110-hp VW GTI of that time. The car feels lively on its short 96.5-inch wheelbase, and it’s a joy to toss around. I pitch the Integra into a set of esses, and the rear end on its torsion-beam suspension skates out as I flick it left to right and back again. The steering is light but precise, while the short-travel, torsion-bar front suspension sends clear messages from the road surface. Nail the four-wheel disc brakes (a big deal in a small car during the 1980s), and the 195/60HR-14 Michelin MXV tires on cast-aluminum wheels do the job, as this is a fair amount of good rubber for the era. This lightweight car can pretend to be a hushed, premium-brand luxury conveyance, but it really wants to be a raucous sports coupe. It’s a car that looks and feels grown-up, but is damn near impossible to be mature in. As the Integra evolved into the too-sporty RSX in 2002 and then the too-luxe 2013 ILX, it lost much of its character. Or maybe all of us got too used to small cars modeled on the BMW 3 Series. For all that, the Integra established Honda’s premium brand in America, and it’s the car we wish we could buy at an Acura dealership today. Want an Acura Integra? Well, you’ll find that Craigslist is overpopulated with them. Acura sold 794,197 examples of the Integra here in North America between 1986 and 2001 across three generations, and the first-generation cars of the 1980s have been pretty thoroughly used and abused by now. Truth to tell, the third-generation car offers 140 hp plus VTEC variable valve timing, not to mention way more style. And while our friends at Hagerty Insurance tell us that 1980s cars are indeed becoming collectible, even the very best example of a first-gen Integra rarely brings more than $5,000. At this price, you could build it up with every sort of CRX Si performance part and still have plenty of money left for a cheeseburger. Don’t expect to make money on one of these cars; simply enjoy driving it. I purchased a new 1987 Integra LS 3-door in November 1986 to replace my 1981 Accord hatchback. The price was somewhat higher than mentioned above as Air Conditioning was not included as standard equipment. While I looked into purchasing an Integra here in Florida, the dealer had a $3000 AMV line item on the sticker. "Adjusted Market Value". When I told the salesman that planned on buying an Integra, but would not pay the AMV, he told me it was not negotiable - if I didn't pay it, someone else would. When I learned that there were two Acura dealers in Michigan, both in the Detroit area, I decided to pay them a visit while celebrating Thanksgiving with family up there. I drove away in my Integra LS 5-speed with floor mats, mud guards, and A/C for $12,600, all taxes and fees included. This was less than retail, possibly due to the disdain for Japanese cars in the hometown of the U.S. automakers. This car was such a dream to drive. It would pull past its 7000 RPM redline, its engine so smooth it was music to my ears. There was never any undesirable harshness or vibration under any conditions. This car served me well and was very reliable. I finally sold it to a friend after 10 years and 185,000 miles, not because it needed replacing, but because I was lured in by a shiny new Super Sonic Blue Pearl Integra GS-R. When my friend finally watched someone else drive the old Integra away, it had over 300,000 miles on it and the engine had never been taken apart. What you may not know: In the early years of Acura, each Acura sold included the factory service manual. I don't know how long that lasted, but I expressed my disappointment when I took delivery of my 1998 GS-R and found that the service manual was not included. drmix, tegr1, gsrider004 and 2 others like this.